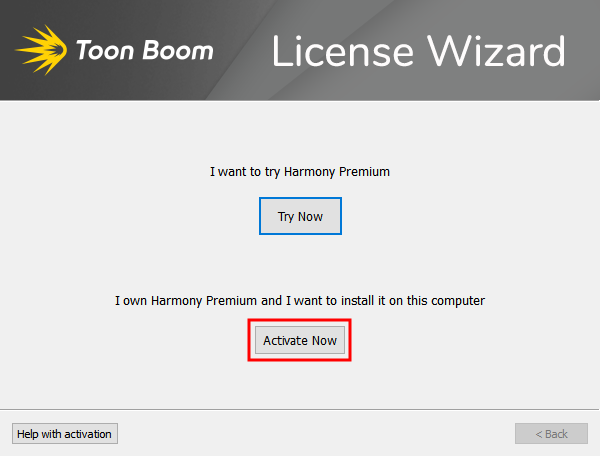 If you have purchased a perpetual license for a Toon Boom product from the Toon Boom website, you can activate your product by launching it, then signing in to your Toon Boom account from the activation prompt. Activating a desktop subscription license requires a direct connection to the Internet. Make sure that you are not connected to a proxy and that your firewall or network is not configured to block access to the Internet. Near the end of each subscription period, when you launch the product, it will verify with the Toon Boom license server that your subscription is still in effect and automatically renew your license in the background. This process also requires an Internet connection. Start your Toon Boom product. The Activate Now dialog appears. NOTE You can also launch the License Wizard directly—see Starting the License Wizard. In the Email field, enter the email address for your Toon Boom account. In the Password field, enter the password for your Toon Boom account. Click on Sign In, then wait while License Wizard connects to the Toon Boom server. The Activation Successful screen appears. It confirms the product you activated and the date at which the current subscription period will end. NOTES The date at which the license expires is actually five days after the end of the current subscription period. Those five days are a grace period to make sure there is no gap between the expiration of your license and its renewal. Click on Start to close License Wizard and launch your Toon Boom product.